I understand that working on a design project is exciting and you want to rush back with all the things you love about your new design and all the things you’d like to change up. But if you take your time and follow the points below, you and your designer will be completely on the same page and the project will go swimmingly! Basically, your feedback needs to be organised. If you’ve ever received an email which has multiple paragraphs and lots of information, you will know that it’s tricky to take in all the information and bit out the important bits. If you can, separate your feedback into sections (headings for different pages or styles) and then use bullet points for each section. This makes your feedback much easier to read and understand and means it is much less likely anything will be missed off or misunderstood. If you are working with a team to complete your design and there are multiple people involved with the feedback, the best thing to do is get together with your team before you send any feedback to your designer. I have worked with teams in the past who have sent their personal feedback separately which can be contradictory and cause problems with the projects. Also, receiving responses from too many people can cause delays in the project which can be a problem for you and your designer. If you can all sit down together and discuss the feedback together and then send a list of the things you have agreed on, everyone in the team will be satisfied and there won’t be too many disagreements. There is nothing more confusing than getting wires crossed on what you call different parts of a website or thinking someone is talking about one area when actually they mean somewhere completely different. A really easy way to stop this confusion is to add screenshots to your feedback. This will add clarity to your points which may be lost without the supporting image. And it couldn’t be easier! Use your snipping tool on your computer or laptop, or even screenshot on your mobile and add the images into your email as backup to each point. Make sure you reference the images as much as possible so they aren’t just attached with no explanation. Your designer is dedicated to creating branding or a website which is perfect for you. Don’t feel like you are hurting their feelings with constructive feedback as they want to get it right just as much as you want it to be right! Be as honest as possible with your feedback and if you don’t like something, don’t be afraid to point it out! There is nothing worse than finishing a project to find you are unhappy with a part of your design which you could have changed if you had brought it up earlier. Make the most out of your revision rounds and point out anything that isn’t perfect for you. Just remember to be nice! It may seem like feedback has to be in the form of “change this”, “I don’t like this”, but the other side can be just as important and will keep your designer happy too! 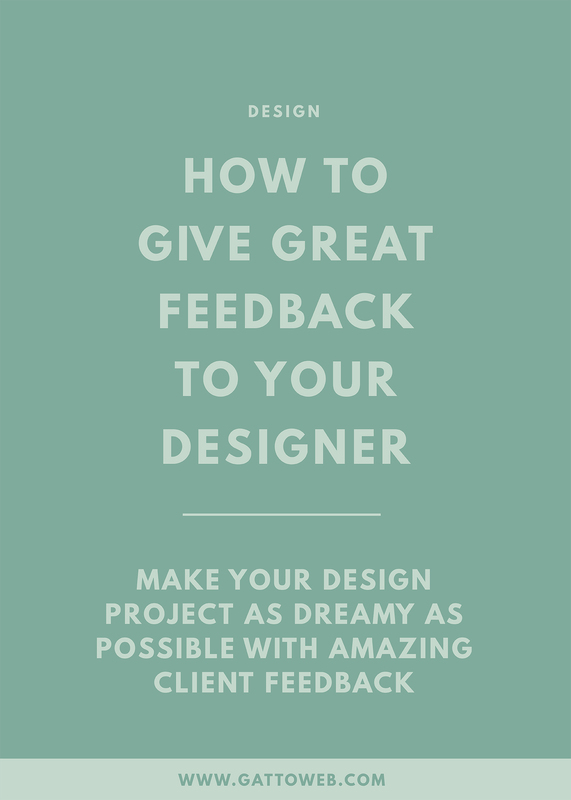 How do you like to receive feedback from your clients? Or what kind of collaboration would make your projects run smoothly?